Now- to unlock the key ingredients so the kids you love in your life can also get ahold of this special recipe… For starters, I have found that the Thymio Robot along with Autodesk’s TinkerCAD and RobotMagic- a brand new technology that allows kids to program robots in a web browser are the best tools. When I say “best”, I do realize that that is a big claim. But in terms of bang for the buck and the simple delight and learning that kids achieve- yes- the best. Thymio robot is an innovative open source robot with more than 20 different sensors, 2 motors and 40 programmable lights that provide placements to attach LEGOS, and even place a marker to create drawing projects. It was developed by a bunch of passionate educators wanting to change the world for the better- as a learning tool. Kids as young as 3 have programmed this robot with a computer, and colleges also use it to teach beginner programming courses Most little robots you see out there are toys, but Thymio is an educational tool and platform for the imagination. TinkerCAD allows kids to easily 3D model objects on their computer, refining their spacial reasoning and computer skills. Kids create any objects they want, and even can 3D print them. Until just recently, 3D modeling was only integrated in education for college students pursuing engineering. With TinkerCAD in the classroom, 6 year olds are 3D modeling. Best of all- the programs created in robot magic are fully accessible through a web browser that allows kids to quickly be able to visualize and run their programs so that they may quickly experiment and iterate on their projects. And even more remarkable their code controls the Thymio Robot IN REAL LIFE! So whatever you create on your computer can quickly be brought into the physical world. The kids have truly fallen in love with these trifecta of powerful tools. And when used in conjunction with TechyKid’s innovative curriculum that is based on design thinking and inspires kids to be flexible in their thinking and not to be afraid to fail- students are reaching new grounds with their projects. 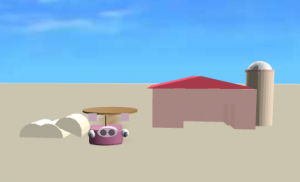 Scarlett, a 9 year old in 4th grade created 3d modeled an entire barn and piggy costume for her Thymio then with RobotMagic brought her creation to life- programming her robot playing in the mud and cleverly tracking mud from a nearby puddle. 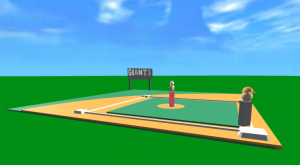 Luke, an 11 year old in camp modeled the San Francisco Giant’s stadium in TinkerCAD, and then placed one of his runners on the Thymio robot and had it run around the bases. Using these tools and innovative curriculum and style, the classroom transformed into student driven learning and exploration, with kids involved in helping each other reach success. Camp leaders and teachers were able to easily track their students learning with integrated assessments that kids are actually excited about and further their understanding of the material. We had a healthy mix of half boys and half GIRLS in our camp- a ratio that is practically unheard of in most tech camps. And we are able to achieve this by giving our participants purpose in their projects and by using such great tools- and along with great staff of course.